Our Spring 2019 Schedule of classes is available now! Download the PDF here: Spring 2019 Schedule Click on the blue bar below to enroll online. TO ENROLL IN CLASSES, CLICK ON THE BLUE BUTTON ABOVE FOR THE SESSION YOU’RE INTERESTED IN. THERE WILL BE A FULL LIST OF CLASSES WITH DESCRIPTIONS FOR YOU TO DISCOVER. Choose the ones you like and add them to your shopping cart! We strive to provide a creative work environment for developing art and design skills. All of our instructors are highly educated in the arts, most of which have earned art degrees and/or have been working in the field for many years. We have courses that focus on drawing, painting, pottery, photography, mosaics, sculpture, fused and stained glass, theater, music and dance. Specialty subjects are offered each semester as well. KEEP CREATING, VISIT OUR OPEN STUDIO! 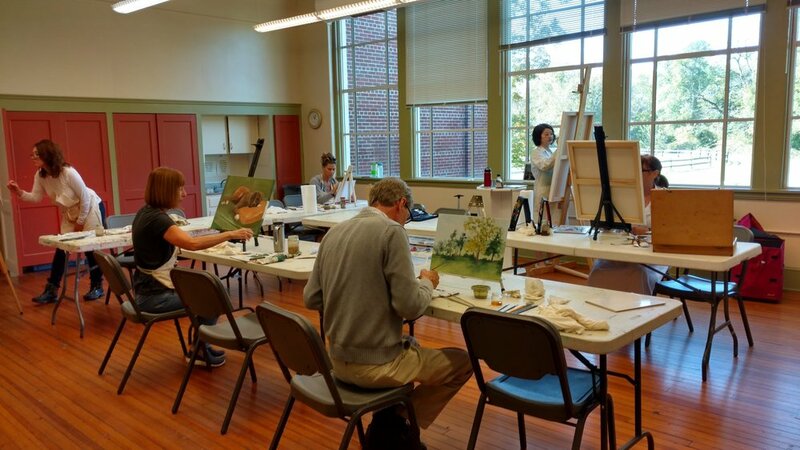 Open Art Studio at CCArts on Wednesdays! Through the generous support of our local community, grants, and fundraising events CCArts has financial aid available to students year-round. Students may receive full or partial scholarships based on financial need. Material fees may be required from each scholarship recipient. Applications for full or partial scholarships must be returned to CCArts at least one week before the intended class begins. Please contact CCArts for more information and an application: 302.239.2434. Tia Santana working with a summer student on refining her work on the wheel. Fused Glass classes led by Jamie Warner always inspire students to make beautiful things to take home or give as gifts. Another winning production of “The Wizard of Oz” led by director Rachel Barton. Eo Omwake guides a student with their painting. Sample of Heidi Benson’s students work like what will be done in Heidi’s Portfolio Prep Class. Roberta Gerard shows a private lesson student some painting techniques. Interested in taking private lessons? We have many private lesson instructors who can offer lessons in visual arts, music or drama. Music lessons include piano, voice, violin, guitar, flute, tin whistle, Celtic harp and clarinet. Students make arrangements directly with the instructors and mutually agreeable times are determined. Lessons take place in the studios at CCArts. For a full list of current instructors, click here: PRIVATE LESSONS.